Merry Christmas librarian friends and Destiny users!! In the elementary schools I did not follow these updates closely. I would get the notifications and scan the new features, but the updates did not change how things operated at the elementary level. 14.0 has something for librarians and users at every level! Follett is constantly finding ways to modernize and make updates based on user feedback. I am excited to be surprised and see the shiny new user interface. Now that I am developing a high school perspective, I am learning about the advances with Destiny's Universal Search, an update which came a couple versions back. Universal Search integrates the books, databases and ebooks into one search, providing users with a streamlined ability to research. Destiny 14.0 introduces Discover™, the new name replacing Universal Search, BryteWave™ K-12, and Follett Shelf. Oh thank you for simplifying!! I am IN LOVE!!! This will FLIP how kids locate library resources. I added the Google Chrome extension today and will admit that at first found the black box at the top of my search results a little annoying but then found the hide button. Then I realized the brilliance: Kids are constantly using Google to do their research. I do it too and I know better! Once you install the extension, got to GoFollett.com to select your school (or you can go to your school's Destiny Discover home page). 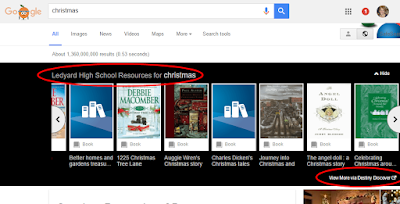 Your library's Destiny search results will appear above your Google search results. EVERY SINGLE TIME YOU DO A GOOGLE SEARCH ON CHROME! THIS IS HUGE!! Why do I love this? Because if students' have the extension their computers, then every time they just decide to Google something for research, they will be reminded that there are so many better places to get good information and not to rely on Google. Students can link directly to the school's Destiny page from the results in the black box by clicking a resource or the link in the bottom right corner of the box. In order to access the full potential of their school's Destiny resources, users will have to login at the actual library site. I cannot wait to introduce kids to this extension as every time they do a Google search they will be forced to remember the mantra "I will not use Google for research...I will not use Google for research...I will not use Google for research." Oh SSO there should be a Christmas carol dedicated to you!! How lucky I am that we are a GAFE school district this year? Gone are the days of creating usernames and passwords for students on multiple accounts and constantly reminding students how to login. With everything else I have to learn, this makes me so happy. There is more that I don't even completely know about and understand yet. Destiny will work with Baker & Taylor, Biblionasium, and the #GoOpen initiative. You can read more about the new 14.0 features and/or attend a webcast on August 23rd. Sign up is required for the webcast Christmas Party (ok have I gone too far?) offered by Follett.